Florida can said to be a mirror of the USA in a way. For example, I live in St. Augustine Florida. 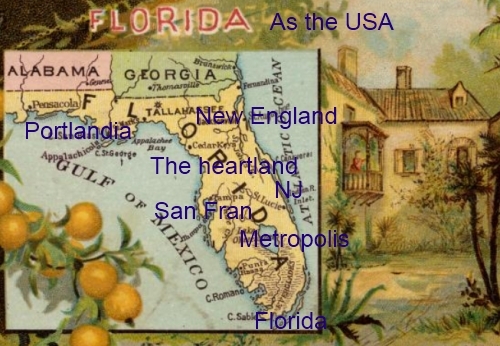 I say that I live in the New England of Florida. It is in the North East corner of the state and gets the coolest weather. It has four seasons and predominately hardwood, oak and pine as opposed to palm. It has a New England feel because it is old and historic, much like Boston. Here are many neighborhoods with kids running around not just retirees as well as expat New Englanders like myself. In fact, the French settled in Jacksonville when it was Fort Carolina early one, like the Acadian of Maine if you may. However, the metaphor of the United States of Florida does not stop there. Miami is like Florida. It is the place Floridians go to retire or enjoy some warm weather in the winter. I could not believe it when I first got here. Many Floridians say they are thinking of moving further south for the warm weather. I was like what is this, this is Florida the weather is always warm. These are the ones wearing sweaters in the fall here. I guess your body adjusts. Be coming from Poland, I am still swimming in November no problem. South Florida includes Palm beach. Miami is Miami, if you may. The west coast (Of Florida and the USA) is filled with alternative lifestyles like the Amish of Sarasota or the ‘colorful’ and ‘open’ artistic communities around Tampa bay, in other words San Francisco. There is even a Hollywood, Florida but that does not quite fit the model, perhaps Miami could be the LA. The Florida Keys are Hawaii for obvious reasons, when you are tired of seasonal variation, just go island hopping. We have said if we can not take the winters up north we will just go south for a trip to the Keys and Miami twice a year (We live in St. Johns county, Florida). The Heartland of Florida is from Palatka west. Farms and small towns much like the center of the USA. I could not believe that the garlic in Publix is from Florida not China.Yes it is a large agricultural state in the center. What is Orlando? I was having trouble identifying that with a particular city as it is so large and diverse, so I will call that the metropolis, much like Washington, Philadelphia, NYC etc is. It is the center of varied cultural activity and economics. However, I think the Space coast could be Washington if for nothing else it being a government district. I would say culturally Daytona is the Jersey shore. It’s just the way I see it, I would not want to live there unless I had to. I have even heard they are trying to open up some Vegas type activities, but that is in the south-west of Florida of course. Jupiter,Florida and the East coast is like lets say North Carolina and Virgina, rich and nice, but get hit by an occasional storm like the outer banks do. I would like to say Georgia is Canada, but I would rather leave that title to North Carolina for personal bias reasons. Raleigh might be Toronto while Winston-Salem might be Montreal and the Appalachian chain of the Blue ridge mountains are the Canadian Rockies where you have Vancouver the hip and cool Ashville, NC. The Panhandle of Florida might be something like Portlania. There are some hipsters do live there to make this work. Much of Northern Florida is being left to others, as it seems to be the rust belt and not too rich, people move south in search of work, like the Buffalo regions of New York. Some people think is it rustic and romantic but for me, I prefer a different type of living. Demographically southern Florida is largely Spanish like parts of the southern USA. It was once New Spain and now will again be Spanish in the far future culturally. Demographic waves are too big. Economically the whole state is bust from Real Estate speculation. The USA is like Florida and Florida is like the USA. Florida is a swing state in the election. In fact I think in the next election whoever gets Florida will win the election. So again Florida is the USA. I am living in the United States of Florida. I saw your video on YouTube. I was wondering what part of Anastasia Island you prefer. Like you, I’ve only done research via the internet and have made the decision of Anastasia/St. Augustine. I won’t be moving as far as you did though … I’m moving from Ohio. Thanks for your info. Are you the European couple who commented on the City Data Forums too? Okay … great to hear you guys are enjoying life! Yes we are European and American. Where we are is the north part of the Island and it close to the State Park and the YMCA so we like it. However, the south park has larger homes and is more exlusive. If you like family community the North to center part of Anastasia Island, but not north of the lighthouse and not on A1A. The best for a family or young couple is arround the YMCA to Pubix. South of that it is pricey for real estate but beautiful. North of the lighthouse is a strip of old hotels. I highly recommend St. Augustine because it is a historic feel and nice climate. It also has four, OK three seasons like Europe, with lots of hardwood and pine. It also has the best schools since it is in St. Johns country. There are not downsides but the rent or home cost is more because it is a great place to live. If you live here the Island not the city or the county is the place to live if you can afford it.